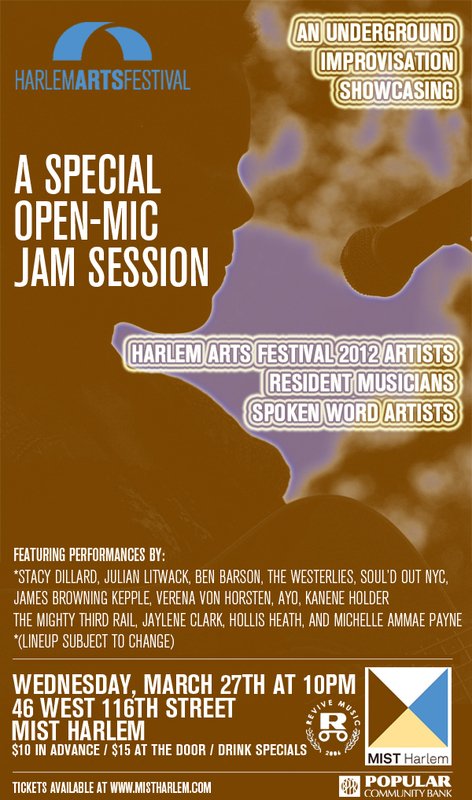 Harlem Arts Festival hosts Open Mic Jam Session March 27 | HarlemGal Inc. Listen up Harlem! There is a fun event happening tomorrow! The Harlem Arts Festival (HAF) is hosting an open mic jam session at My Image Studios Harlem (MIST Harlem) tomorrow (March 27) starting at 10 pm. HAF is hosting this event to raise money for this year’s 2013 festival. Tickets for the Harlem Arts Festival’s open mic jam, costs $10. Interested in attending? Go here for tickets. This entry was posted in 116th Street, art and culture, Community, entertainment, Events, Harlem, Harlem blogs and tagged 46 West 116th Street, arts, Entertainment, Harlem, Harlem Arts Festival, MIST Harlem, My Image Studios, My Image Studios LLC, Neal Ludevig. Bookmark the permalink.